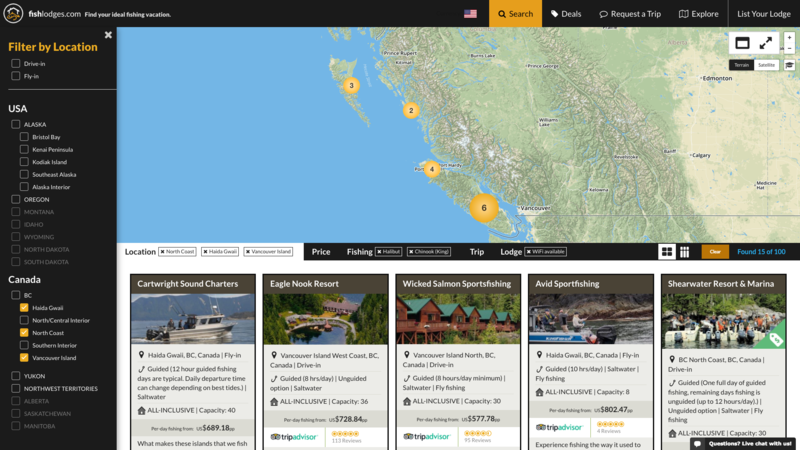 Victoria, BC, Canada - Fishing vacation website fishlodges.com has been updated with a new search experience, allowing users of the site to filter fishing lodges and resorts in the North American Northwest by a wide array of attributes. The Search tool allows users to filter the entire set of lodges by 20 of the 124 types of information collected for every fishing lodge. Filters include location, price, fish species and type of fishing, guided or unguided trips, trip duration, lodge rating and number of reviews, and more. Once lodges are filtered they can be compared “apples-to-apples” and then individual lodges inspected in detail.